Head of the Archive Unit of the IPB University, Drs.B.Mustafa, M.Lib said that archivist positions play an important role in improving the performance of the Institution. This was conveyed by him in the Guidance and Employee Work Target Consultation (SKP) for Functional Officials of the Archives of IPB, Monday (4/2) at Dramaga's IPB Campus. "It is expected that archivist functional positions will become pioneers for certain functional positions that apply assessment based on SKP, so that the archivist contribution to IPB University is more maximal," Mustafa continued. Besides that, according to Mustofa, after participating in this activity the archivist functional officials of IPB University were expected to be better able to make / compile SKP and be able to determine the time and description of work according to their respective positions, so that SKP and time targets can be fulfilled. 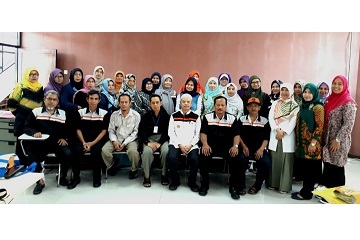 The Guidance Program and Employee Work Target Consultation (SKP) for Archivist Functional Officials of IPB University was held in order to improve the knowledge and skills of IPB University archivist functional officials in the filing of employee work targets (SKP).